While the entropy of most plays is fairly to understand, finding the entropy of more complex strategic techniques can prove challenging. It is intuitive that plays that inhibit bingo lines and increase scoring options reduce entropy (while plays that open bingo lines and block scoring options increase entropy). However, the entropy of other plays, such as fishing plays, setups, various board dynamics, etc. is not so readily apparent. This page seeks to illuminate the entropies of more complex concepts, as well as how this can affect various plays. Fishing is an inherently risky play, since you’re sacrificing points immediately merely for the hope of drawing a bingo on your next turn. Many times this risk is necessary, especially late in the game when drawing a bingo is the only way you can win. The entropy of fishing plays maxes out when your odds of playing a bingo on your next turn is around 60%, making the vast majority of fishing plays quite risky. When your bingo percentage is significantly lower than this, it lowers the entropy since many of your outcomes will result in failed attempts to bingo, both next turn as well as future turns. (You might never get to play a bingo.) As your bingo percent soars past this number, your entropy starts to decrease as a bingo becomes more and more assured: if not next turn, then on the turn after. In this position, there are three fishing plays available: ME (EENRST) and EM/EMU (ENRST). ME leaves a very strong leave, but also creates a problem, as your opponent is likely going to block the JUG-S hook, making it harder (but still possible in many cases) for you to play a bingo. Although you’ll often draw a bingo, some of your bingos will not fit on the ensuing board, making your odds of playing a bingo just over 50%, making ME a very dangerous play. Meanwhile EM/EMU opens an additional strong bingo line (in columns b or e), but it does so at a cost, by getting rid of one of your Es. Because of this, you will often need to draw a vowel to play a bingo, and even then, a bingo is far from a guarantee: thus, you will also have a bingo percentage at around 55% after EM/EMU. 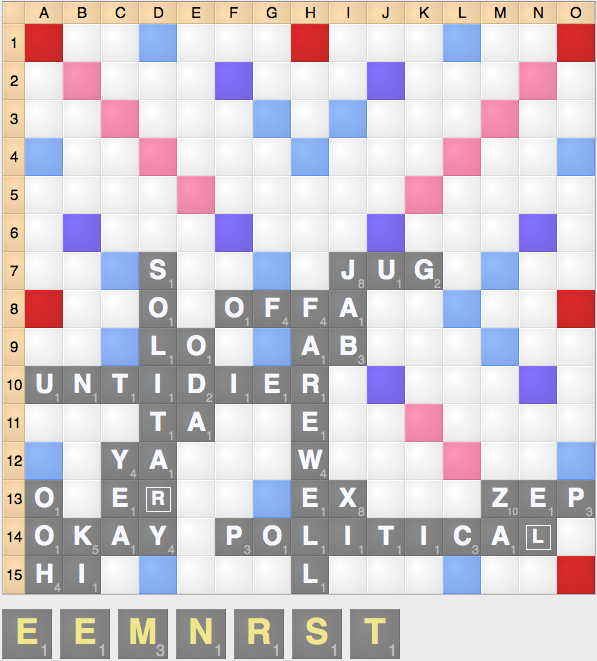 At this score, you are better off playing SEGMENT because of the entropy. If you were behind, or even if the score were even, you should certainly choose one of the fishing plays, as it has a slightly higher equity and the increased entropy is no longer a drawback (if you’re behind, it’s a benefit). Unlike fishing, setups overall reduce entropy, since they guarantee an opening on your next turn. As long as the setup is difficult for your opponent to use or block, setups are a reliable way to guarantee points for future plays. Even if setups are blocked, so long as those blocking plays don’t score too well, entropy is still reduced as it limited the variance of your opponent’s score. However, there are some components of setups that do increase entropy. If setups are often blocked or used (especially while your opponent can score), that can increase your opponent’s score. 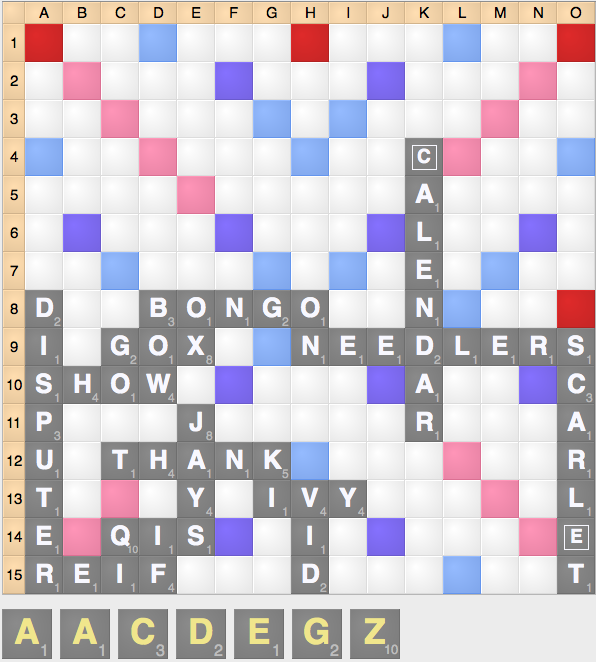 In addition, setups often require sacrificing guaranteed points and/or leave which also increases entropy. In this diagram, a play like CAGED 7h (setting up GEEZ j7) does a great job at reducing entropy, regardless of whether or not your opponent realizes that you are making a setup. Even if your opponent does detect your setup (and they probably won’t) most blocking plays won’t score a lot of points, giving you another avenue to reduce entropy. While this wouldn’t be a good play if you were down 100, in a close game or ahead CAGED would be a fine play. While you can set up GEEZ in this position, or make a better setup such as GOR d4, this is a much worse position to make a setup, as there is a lot of entropy still in this position. GEEZ forms an obvious setup, and GOR allows your opponent to make a high scoring blocking play even if your opponent doesn’t detect the setup (and they often will suspect you have the Z). While GOR is certainly a reasonable play, it has a lot of entropy since your opponent will often block: instead, a play like ZIG d2 has a lot less entropy. Setups don’t have to be immediately usable in order to be effective, especially if you can combine them with other entropy-controlling metrics. 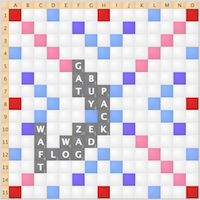 Here, a place like SAUCE 14k is a strong play, as it opens a scoring spot, blocks a bingo line, and creates a good scoring spot: these are ALL good things for controlling entropy. If your opponent takes the scoring spot, then you can continue to make high valuation plays that control entropy even further. Not all setups or scoring spots are low entropy. 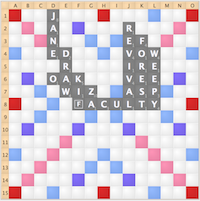 In this position, the first person to draw the Z can score upwards of 100 points. Against weaker players, you want to avoid entropy more often when ahead and be willing to even reduce entropy in situations where the game as even, as you are likely to outplay your opponents and get into an advantageous position. While in many ways it’s more important to limit easy plays (even if they are scoring spots), you want to also reduce entropy with close scores, as you become a favorite against a weaker even if the score is tied. Likewise, against stronger players, you want to create entropy, especially since stronger players will actively try to reduce entropy against you, even at the cost of points and/or leave. Another type of entropy that only shows up against weaker players is knowledge entropy. One common tactic against a weaker player is to set up a potentially lucrative hook or extension that only you know, and while this can be a good idea, it puts you in the uncomfortable position of asking yourself whether or not you should block that hook or extension once you get a lead. 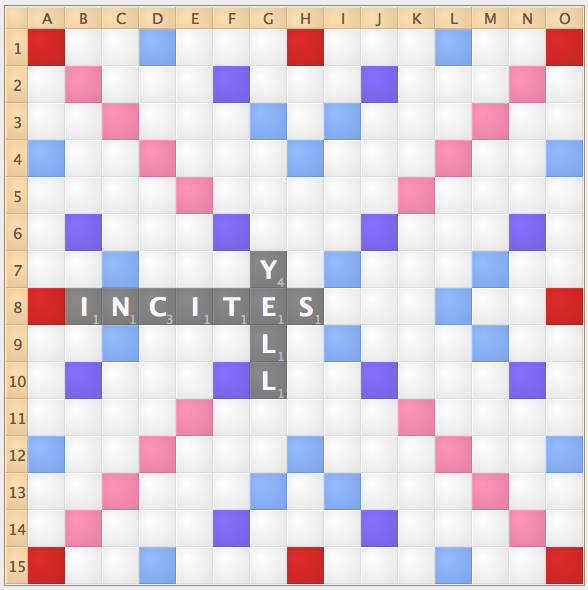 Because you don’t have access to your opponent’s Scrabble acumen and whether or not they see the potential opening, creating these spots can sometimes carry a risk, even if they are worthwhile. 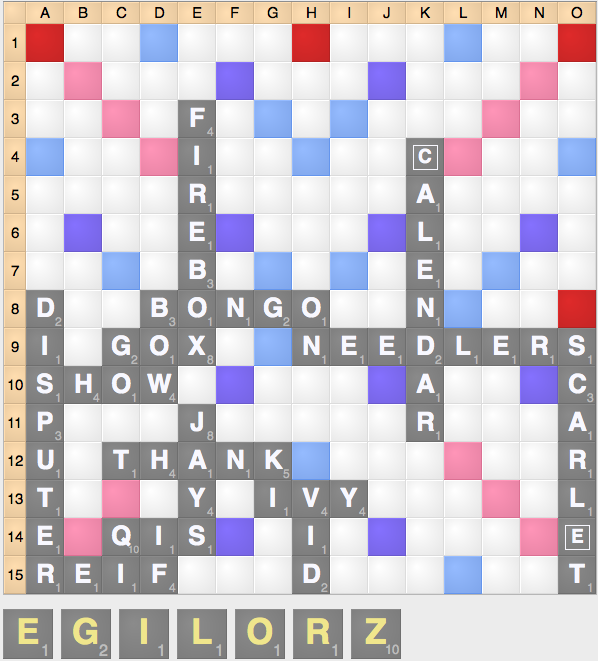 Another important way that entropy impacts Scrabble is its impact on board dynamics. Before we continue, it is important to define an important difference between immediate entropy and long term entropy. Immediate entropy refers to the effect on entropy next turn, while long term entropy refers to the entropy over the course of the entire game. There are two types of board dynamics: open board dynamics and closed board dynamics. There are two types of open board dynamics: rivers (which open the board by giving players lots of different lanes to choose from) and open flowers (which lead to a lot of hooks and short openings that leave enough space available so both players can play a bingo). Rivers are good for short term board entropy, but they can be bad for long term board entropy since they can also be used for exhaustion. Open flowers might open less immediately and thus don’t improve short term entropy as much, but often do well for improving long term entropy, especially if they are difficult to close down. Closed board dynamics can be characterized into two types: restriction and exhaustion. Restriction is great for short term entropy, but unless the board is entirely restricted, it doesn’t do much for long term entropy since it relies on limiting access to a quadrant. If that quadrant is ever opened, then entropy spikes up drastically. Exhaustion is just the opposite: it opens things up, but once all of the lines are exhausted, they are closed forever. Exhausted boards are more of a short term threat, whereas restricted boards serve as a more immediate threat. In Diagrams 1 and 2, despite the board initially seeming very closed, there is a medium amount of short term entropy and a long term entropy. There are few scoring spots but clear bingo lines from the open C as well as S hooks. While it’s somewhat difficult to hit these openings, over a few turns these openings will eventually be used, giving players access to the rest of the board and creating a much more entropic board in the future. 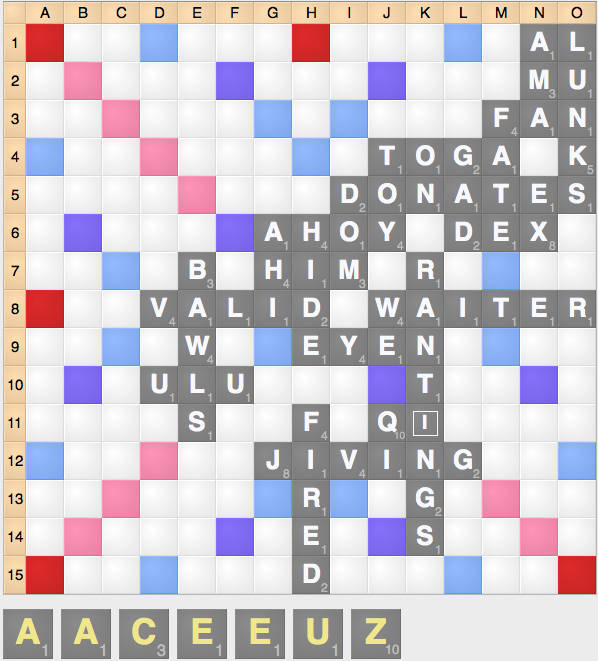 Even boards with limited potential for scoring and/or bingos in the short term can be extremely entropic in the future. 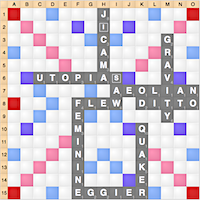 A player with the lead might be able to close the board on future turns, but doing so is quite difficult because of the available open flowers. In Diagrams 3 and 4, there are a lot more immediate openings but the long term entropy on both boards is quite limited. 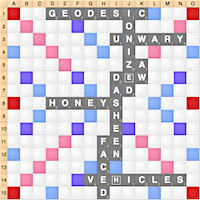 In both diagrams, the boards are nearly exhausted, and in a few turns both players will run out of space to play a bingo, and the edges of the board will serve as a deterrent to bingos. While the short term entropy is substantial, the long term entropy is very limited on these boards. Before I conclude, I want to note some final thoughts on entropy. While it’s easy to look at entropy as a phenomenon that only applies to the next turn, sometimes the immediate future is not the only thing to consider, but rather, the series over the next few turns. While sometimes it’s difficult what will happen on future turns besides next turn, in other cases it is somewhat easy to figure out what will happen and is also vital to your success to determine how this will affect entropy. In this position, you might consider playing HAVARtIS 10e (65) over SHIV l12 (52), since the AA? leave will probably not score 13 more points on average next turn, and that the AA? 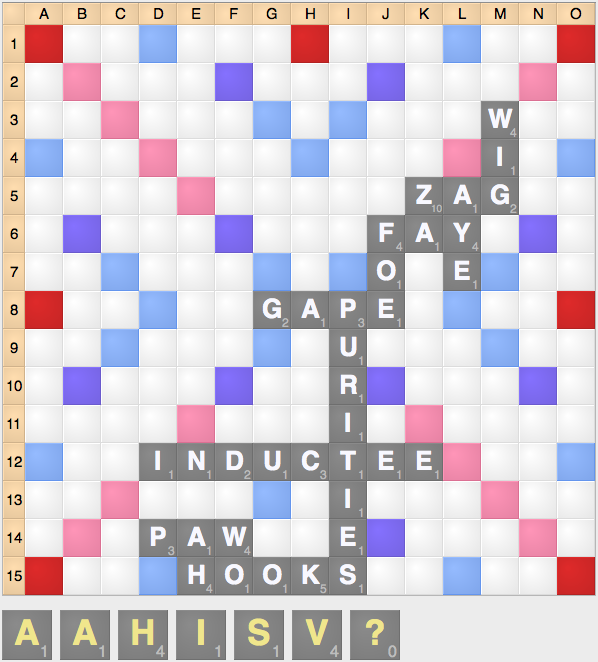 leave has a high rack entropy on the next turn. While this fact is true, this should not deter you from playing SHIV, since while the rack entropy next turn might be high, the rack entropy over the next few turns is much lower. With a blank, you’ll often get to play a bingo eventually, and in the meantime you will usually be able to score, and since you’re ahead, your opponent will also seek to increase board entropy, making the blank’s tile equity substantially larger over subsequent turns.